Wow. We closed another show last weekend. It was a huge effort. Enormous. This is where I say thank you to the many, many people who made it possible. This was a huge undertaking. There are so many people who made it possible. Thanks on our website seem paltry and inadequate, but it is what we can do. Honestly, it would be impossible to properly thank them. Just know that if you enjoyed the show - you saw power, trust, honesty in performance, you were affected by this story - it was not just the people on the stage that made that happen. First, thank you, again, as always, to our Kickstarter supporters. For reasons that are probably obvious, this show was not an easy sell. In addition, we lost most of the first weekend to snow. So financially, this show is tough. Our kickstarter supporters, those that gave a little more to be in our program and website - thank you! You made a huge difference, and your money went directly into putting the show on stage. Let's not forget some people who were able to help us load the show in and out. Matt Spittler, Chris Hayworth, Matt Fields - thank you! To Josh and Michelle (and everyone at Sonorous Road)- thank you as always. You have been as supportive as anyone could hope for. Not just folks willing to rent their space, but real companions in the journey, going above and beyond to help the show in any way you could. To Kevin Ferguson at Cardinal Gibbons High School - Thank you. Being able to rehearse in your space is a huge HUGE help to our production. One of the single biggest contributions to our show every year. Thanks also to Ian Finley and Jerome Davis for being willing to make space available for us on a fill in basis. Speaking of fill-ins - Lauren Knott and Kieth Bugner - thank you! You were both able to step in to help us when Andy wasn't available to stage manage. Thanks for giving us your time and assistance! Thank you as always to the other theatre companies that let us rent/borrow items. Justice Theatre Project, Theatre in the Park, and RLT and some others (you know who you are). This is a theatre community that really cooperates and helps each other. So happy about that. To a number of people who helped us in ways big and small. Jeff Nugent - thanks again. You're help is just so amazing. Letting us borrow your help and your truck on short notice, helping with little details and big ones. And Nora Kelly - thanks for being willing to help when I needed a truck. Aaron Alderman - thanks for being able to drop in and help us record a very special song with Marleigh. Such a special touch to the show. Diana McQueen for helping us hang posters. Thank you, I just ran out of time, and having another person passionate about the show and willing to help was huge. To our technical director Todd - wow. I rely on you in ways big and small, and you always have time and patience to help me. I really appreciate that. None of our shows would have been possible without you. I designed this set - and I promise next time (if there is a next time for me doing that job) I will DO BETTER. I will measure more carefully and communicate more fully. You did well to put up with me and roll with the punches. So thanks! Will Mikes, our sound designer - thank you! In addition to designing the pre-show music and our ni show sound cue (only one this time!) Will recorded our curtain music with Aaron and Marleigh. Sound design is often under appreciated. I loved the mood that the music set for the show (mostly Phillip Glass by the way). To Alyssa - our ASM and our Lighting Designer (by default). Thank you. You put in so so much work on this show. The lights were perfectly awful - bleak, washed out, unforgiving. And when Todd had to spend time working on the set (because I messed up... see above) you stepped up big time. You ran the cables and hung all the lights. And in the show, the office simply would not have been "alive" without you. Thank you. Jennifer... well of course thank you. Those amazing AMAZING images? Jennifer did them all. The photography, the layout, the design, the look, everything. It was an incredibly professional job. Really blew me away. She also helped create the "color story" of the show (both the colors in the set and the colors worn by the actors) and she designed the costumes. You simply don't understand how important these things are until you have someone who knows what they are doing walk you through it. SHOW you. And then you see. If that wasn't enough, she also took the promotional images. And of course... well she supported me. Thanks for reminding me to center myself when things got crazy. Andy, our stage manager, thank you. You have been a part of almost every production we have done. Your skill, professionalism, and humor are simply unmatched. There is a reason you are on the very short list of the area's best stage managers and directors. Thank you. Katie, thank you for being a wonderful actor and a wonderful human being. This is not an easy show for any young woman to take on. It is a great role, but one that is challenging not just in terms of line load, but the emotion you must take on. Una is not a comfortable person to live with for an hour, much less two months. Thank you for committing so fully, so bravely to this process and this script. Thank you for speaking your mind and your truth in rehearsal, in public, and on stage. Thank you for being a damn good actor and friend, and for working with us on this show. John, of course, thank you. You know what a big undertaking this was for both of us. Your work on stage, and as a production partner... what can I say. We did it again. What we put on stage was simply the best work we possibly could have done. The standard of quality of that production was among the highest I have ever seen in the region (or outside of it for that matter). That final performance - I mean, I am biased of course, but it was easily among the best things I have ever seen performed. Good work. And finally, thank you to our audience. It wasn't the easiest show to see. Not all art is. But that show had a power and yes, a beauty that I hope you appreciated. So thank you. The Reviews Are In, Blackbird Is A Hit! Dustin Britt called it "An emotional roller-coaster ... a must see production." Martha Keravouri and Chuck Galle said "John Honeycutt and Katie Barrett Give Tour-de-Force Performances." Pamela Vesper and Kurt Benrud call John and Katie "Simply superb." Alan Hall didn't really provide anything blurb-worthy, but he liked it. Don't believe me, CLICK HERE to read it (SPOILER WARNING - this review describes the plot a bit too much imho). Roy Dicks says "South Stream Productions tackles this deeply troubling script head on, making it impossible to ignore the questions and implications presented." Byron Woods gave Blackbird "★★★★" and called the show "A thorny garland of questions with no easy answers." Our first weekend was a critical success. Will it be a commercial one? This is a tough play. One of the things we were worried about was: "would people come?" We decided that if we produced a great show. One with truth, and clarity and heart, audiences would respond. I think we did that. I hope you join us. If you like good theatre, this is a show you won't want to miss! Due to a miscommunication with the venue, tickets were available for an incorrect (and cheaper) price. The ticket prices on our website, our facebook page and our press release were the prices we intended to charge. The text of Sonorous Road's website was correct too. But the wrong information was input into ticket leap. As a consequence, some people got a discount. So congratulations! You saved some money! Some press reports also took the price from the website and reported it incorrectly, so we honored the discount for tickets sold at the door Friday night (we made all tickets $10 on Sunday anyway because of the weather). Which leads us to a natural question: why? Our general admission prices have been going up steadily from $15 for our first show, Copenhagen to now. Why are we charging more? But the main reason is very simple: this show is worth it. I don't like to make comparisons when it comes to art, but I feel comfortable saying that this production is among the very best theatrical presentations in the triangle. I would put this up there with every production in last year's top ten according to the INDY (including our own Time Stands Still). Tickets for touring shows at DPAC start at $30 (plus fees) and go up from there. Tickets for Playmakers start at $15 if you want to sit in the corner, but seats comparable to our performance will cost you $57 (again, plus fees). Tickets to Theatre Raleigh are $30. Even tickets to Raleigh Little Theatre run $24 general admission. This show is every bit as good as anything you will see on those stages, and probably better (in my admittedly biased opinion). This is a chance to see a show of incredible quality at a price that is cheap by local standards. Is it more expensive than a movie? Sure. But it costs more per seat to produce. And it is worth it. If you value theatre, if you think it is a worthy medium, if you think it should matter, come see this show. You will not be disappointed. PS - if you are concerned about price, there are still opportunities to see the show for FREE. Sign up to volunteer by clicking here! SNOW DAY SPECIAL! The show will go on! South Stream's production of Blackbird by David Harrower will go on at 3PM today, Sunday, January 8, as scheduled. Come see the show that critics are already raving about! ALSO- for today only, we're having a Snow Day Special! ALL TICKETS ONLY $10! We hate to lose a show, but we have decided to cancel tonight's performance (Saturday, January 7) due to inclement weather. The safety of our audience is important to us, and while the winter storm is not nearly as bad as anticipated, there is enough snow and ice on the roads to make coming to/from the performance more dangerous than it needs to be. If you bought tickets online or by phone - we will be offering a full refund. Alternatively, we will be happy to honor your ticket at any other performance. If you got tickets through our kickstarter rewards - we can't offer a refund but please join us for any other performance. SUNDAY - We are keeping an eye on things, but at this time it looks probable we will have a show on Sunday. More time for crews to plow/salt the roads plus being able to travel to/from the theatre in daylight should make things much safer for you and for us. If you have tickets for Sunday and want to reschedule please contact us at the email below. We will be happy to see you at a different performance if you do not feel comfortable driving to the theatre. If you have any questions, please send an email to southstreamproductions@gmail.com. Opening Night for Blackbird is a GO!!! 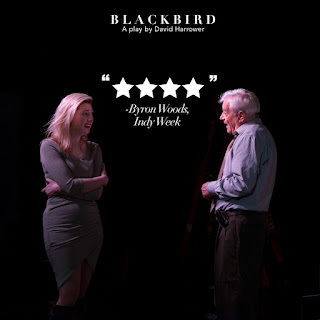 Opening night for Blackbird is finally here. We have put a lot of work into this production. A LOT. And we are very excited to share it with you. 1) WILL THE SHOW HAPPEN? YES! I know every weatherperson in the triangle area is thrilled to be leading the news cast, but every forecast I've checked says that it will remain above freezing until well after midnight. The safety of our cast, crew, and audience is very important to us, and we wouldn't hesitate to cancel if we thought it would be unsafe for our guests, but things really look fine tonight. 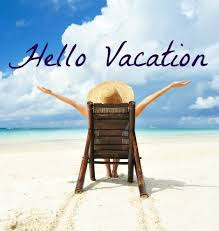 2) WHAT ABOUT THE REST OF THE WEEKEND? If you have tickets to Saturday's show we will make a final determination by 3:30 PM. We will make a decision before then if we can, but expect an update on this website no later than 3:30. For Sunday's performance, we will make a decision no later than 12:00 noon. Please get there early. PLEASE GET THERE EARLY! Leave extra time for parking. There is plenty of parking available if the main lot is full. Please see THIS HANDY WEBSITE with the theatre location and a parking map. I think that's it. See you at the show!! Our Kickstarter campaign was successful. Huge thank you to the following people who helped make it happen! It's January 1. So you know what that means: the next show from South Stream must be right around the corner. We spent the 31st the way most people spend their last day of the year - loading in a set. (That is how most people spend New Year's Eve day right?) It's starting to come together. 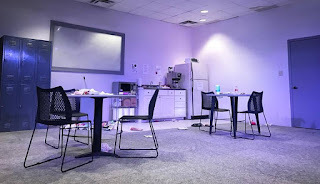 Your typical office break room in the most depressing job ever. It's not done yet, but it's getting close. We had a great group of people. Of course our cast and crew - Todd our TD supervised, Alyssa our ASM ran cables and set lights, and the rest of us - John, Andy, Katie, Jennifer, Chris, Spittler, and Steve: we did what we were told. As traumatic as 2016 has been in some respects, it was great to have something real and productive to do on the last day. Building something good. And the show will be good (dark maybe, but GOOD). Sometimes it's nice to have a task that you can start and see coming to completion. The one thing we can do as artists is produce art. We're hoping to start this year off right. Starting now. We hope you share this with us.